I am a big believer in taking care of your skin. A good, well rounded routine is the best way to not only combat signs of aging but also helps fight off breakouts and other skin irritants. I took me a long to realize how important the habit is and I only wish I started really taking care of my face earlier. Now when we about the signs of aging we are talking about a few key issues; elasticity, discoloration, age spots, and fine lines. I have come up with a pretty good everyday system which I find works best for my skin type, however it is important to recognize the type of skin you have and build a routine around it. I have combination skin which is acne prone. While I don’t really get breakouts anymore I do find myself having to fight them off…around…a…certain..time of the month..so It’s important for me to keep on top of it so I can do a preemptive strike! My biggest skin concern is redness, over the past few years I have noticed that my skin has gotten so much more redness around my cheeks and nose so for my skin I have to stick with lightweight products so not to irritate it any further. But enough with the talking…this is what I use! I use to just wash my face without really removing makeup first and while that is better than going to sleep with your makeup on, you’re still doing your skin a disservice because even the best face washes will leave makeup residue behind. 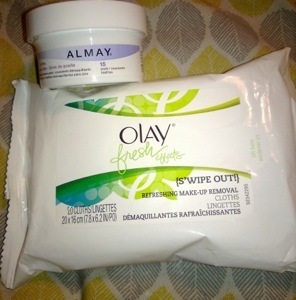 So I start with a gentle eye makeup remover, right now I’m using the Almay sensitive skin wipes. I love these because I am always running out of cotton pads and these are really easy to travel with as well. After I gently wiped my eye makeup off i give my face a good once over with my Olay fresh wipes, I love these wipes because they are super refreshing and don’t dry out my sensitive skin. You might find that your face feels a little oily after removing your makeup so that’s where the next two step come iin. First we have all over face moisturizers, I use to spend so much money on these looking for the best one I could find until I ran out one day and was at my grocery store and found this Nicel daily cream for $2 and being the bargain hunter I am I tried it and man was I pleased. It feels so smooth and I always apply it to my neck and chest as well and it has retinol cream in it as well so I know that it is doing its job, I’ve being wearing it for over a month now and not only do I feel a difference in my skin but it has also not broken me out, so all around pleased…and a money saver too! 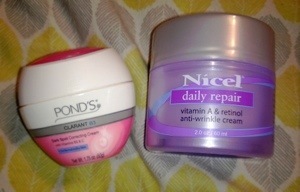 Now this cream I use as strictly a day cream and for night I like to stick with the Ponds dark spot correcting cream so help me combat some discoloration and scarring. Both of these products are under $5 and I am a big believer that the more expensive the product doesn’t always mean a better result. 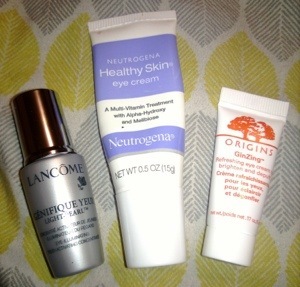 Now we come to eye creams..the is the one step I never really could get into but I know is so important. Under your eyes is the most sensitive part of your skin, and also the thinnest. I cannot tell you how important it is to protect it and care for it. I have always gravitated toward Neutogena products because I think they’re line is great for sensitive folks like me and their under eye cream is no exception. It is a smooth application and doesn’t leave my skin feeling tacky. The major thing I look for in an eye cream is that it needs to really be absorbed well into the skin so I’m not sitting there for an hour patting it in because that is only going to cause more irritation. Now the other two products I received as samples because I’m not one to pay over $50 for some eye cream but I do however enjoy trying them out. The Lancôme eye serum I have been using nightly for the last couple of weeks and haven’t noticed a great difference in fine lines but I do notice that it does keep my under eyes smooth. The Orgins GinZing cream, however, is amazing. I use this in the morning because it also claims to be an eye brightener and in the morning I really need some brightness in my life. It is so soft and it has almost a pearly consistency and it really does help to open up my eyes in the morning. While these are my products for an everyday and night routine there a few other things I like to throw in there, and I call them my big guns. 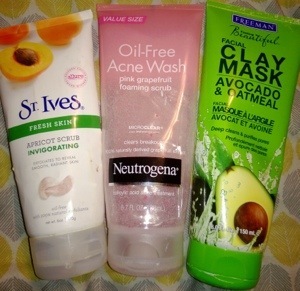 Whenever I’m having a breakout I like to switch to something just a little but heavier that contains salicylic acid to help me out, my favorite of the bunch is the Neutrogena pink grapefruit wash. It really gets in there and pulls out dirt and I appreciate that. Another thing I add whenever I need a refresher (about twice a week) is a nice abrasive scrub because good scrubs literally wash off all the dead skin and all of the buildup in your pores from makeup and dirt. Lastly I like to use a good hearty clay mask and the end of every week, just to refresh my face and kinda of get my skin started for a new week. This new one I have from Freeman works wonders, at first I thought I might have been allergic because my skin was burning a little but from what I’ve read that is normal and I would have been a lot more upset if it didn’t work well, but it did. 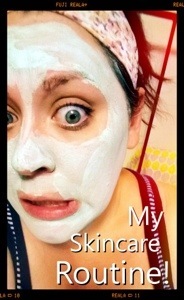 My pores were so much smaller and my skin felt totally rejuvenated. With anything in life, skin care is all about trial and error. While this routine might not work for you, it works for me, and it took me a long time to really nail down the products that work best with my skin. My suggestion? Look for reviews, if you know your skin type and you know what things you want to get out of your products just search for it because I guarantee you that you will find a routine that gives you want you want. My best piece of advise for taking care of your skin? Never sleep in your makeup and always wear sunscreen. Sleeping in your makeup really dulls out your skin and can cause irritation and not protecting your skin can cause seriously sun damage as well as increase your risk of skin cancer. I may never have the same skin I had when I was younger but I’m learning how to protect and maintain the skin I have now, and that’s really what life is. Change and Adaptation. AND…..I am going to be having a giveaway soon! Once I reach 100 subscribers I am going to be doing a beauty giveaway, so let me know below some things you might want to see in this giveaway and don’t forget to subscribe and tell you friends for your chance to take part in the love! « My Super Awesome Birthday Haul!